SCD Complete™ Capsule Formula contains high-potency amounts of vitamins, minerals, trace elements, antioxidants, and natural carotenoids and is recommended as a daily supplement to provide a comprehensive foundation of essential micronutrients. SCD Complete™ Capsule Formula supplies 30 important nutrients in well-absorbed forms and amounts that meet or exceed recommended dietary intake levels, thus supporting many biological processes crucial to maintaining optimal health. beta-cryptoxanthin, offer more diverse benefit and are safer than synthetic beta-carotene alone. A complete array of B vitamins supports many metabolic functions and includes significant amounts of specific B vitamins most crucial to avoiding toxic build-up of homocysteine. • Activated folate and vitamin B12: SCD Complete™ Capsule Formula supplies Metafolin® L-5-methyltetrahydrofolate (L-5MTHF), an active form of folate. Unlike folic acid, L-5-MTHF is absorbed and utilized directly and is the most beneficial form for patients with elevated homocysteine resulting from compromised utilization of folate. • Extra vitamin D3: Natural vitamin D3 is included at 1000 IU daily, a higher amount than typically found in daily multivitamins, to help achieve optimal intakes now recognized to support bone health as well as its numerous roles in tissues throughout the body. 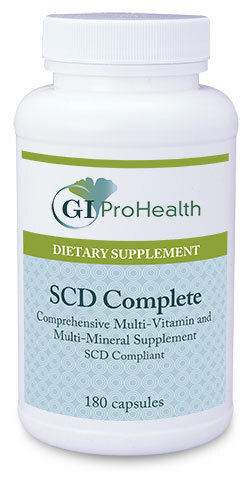 • Bioavailable minerals and trace elements: Because many common forms of minerals used in supplements are not efficiently absorbed, SCD Complete™ Capsule Formula contains mineral compounds that are easy to digest and absorb. Mineral amino acid chelates used in SCD Complete™ are fully-reacted, low molecular weight mineral compounds with exceptional tolerance and documented bioavailability. Calcium citrate-malate is a well-studied calcium compound with higher absorption and effectiveness than many other calcium sources. Organically bound chromium and vanadium complexes offer high physiological activity. gluten, eggs, yeast), artificial flavors, preservatives, and colorings.